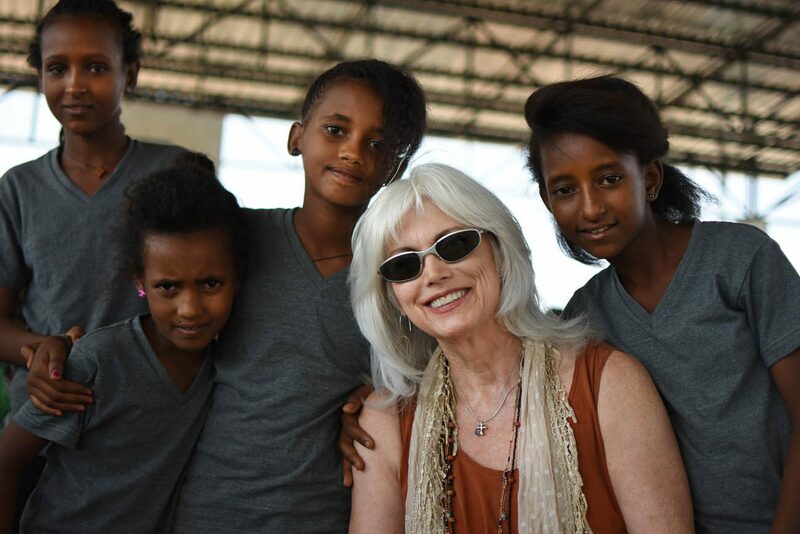 WASHINGTON (CNS) — Emmylou Harris, who has won more than a dozen Grammy awards during a 45-year career singing country music, is heading up a series of concerts this fall to benefit Jesuit Refugee Service. The idea to do so came from a longtime friend, coupled with a visit to a JRS-run camp in Ethiopia for Eritrean refugees. The friend, Gail Griffith, was an early fan of Harris’ as she was playing coffeehouses and clubs in the Washington area in the early 1970s hoping for a break. Harris said Griffith, then a student at Georgetown University, was one of the “three or four” folks who would come to her gigs regularly. Today, Griffith is campaign director of JRS’ Global Education Initiative, which will benefit from the proceeds of the 11-city October tour. In the 1990s, Griffith had convinced Harris of the need to mount benefit shows for the victims of landmines buried during long-since-ended wars. The Concerts for a Landmine-Free World, featuring Harris and fellow country singer-songwriter Steve Earle and given over two years, raised substantial sums. Earle is a part of this mini-tour, as are Patti Griffin, Buddy Miller and the Milk Carton Kids, which is being billed as “Lampedusa: Concerts for Refugees.” Lampedusa is an Italian island between Sicily and Tunisia. It has been a way station for refugees fleeing Libya and other northern Africa countries. It also was where Pope Francis visited refugees during his first official trip as pope. Griffith “thought we could use this same blueprint” for the Lampedusa concert series as with the landmine series, Harris told Catholic News Service in a Sept. 8 telephone interview from Nashville, Tennessee. “Raise some money, but maybe (raise) awareness for the refugee crisis in this country, by putting this same series of musicians on the stage, where singer-songwriters sit and play their music. And while we’ve got their attention, we can talk and focus on this terrible problem — get more people engaged with their pocketbooks and their hearts,” she said. “If it weren’t for scheduling, there were artists who wanted to do this but they already had tours booked,” Harris added, so some others may drop in for a show or two. Joan Baez, she said, would take part in the New York concert. However, she told CNS, what she saw in the camp more than countered the dire warnings given by others. “I came back with a sense of hope and goodness of the people who dedicated their lives to give these young people a chance,” Harris said. She was impressed not only with the school JRS had established in the camp, populated mainly by unaccompanied minors fleeing their homeland, but with “the art and the music and the dancing” they were being taught by staff. Pope Francis endorsed JRS’ Global Education Initiative, which raises awareness about the worldwide refugee crisis, last November, and encouraged the agency to double the number of refugees educated by 2020. Harris said JRS is doing the “heavy lifting” with the concert series, which starts Oct. 6 in Boulder, Colorado, before making stops in Kansas City, Missouri, and Lincoln, Nebraska, and continuing in St. Louis, Milwaukee, Chicago, Toronto, Boston, New York, Philadelphia and Washington. The performers grab a guitar and a chair, sit in the round, sing tunes, tell stories and educate their audience a bit on the refugee situation.